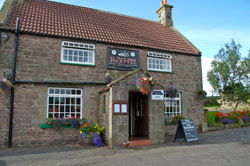 "A traditional village pub and restaurant in Ellingham in the heart of Northumberland also offering bed and breakfast and self catering holiday accommodation"
The quiet Northumbrian village of Ellingham, just eight miles north of Alnwick, has changed little since the ancient drovers’ roads were well-travelled routes. Fields and woodland still surround the cluster of sandstone collages and the picturesque, square-towered church of St Maurice looks across the wide landscape to the spectacular sweep of the Northumberland coastline. Just a stone’s throw from the Al dual carriageway, the Packhorse Inn at Ellingham offers an oasis of rural tranquillity, a superb location for exploring Northumberland or just for a peaceful and enjoyable break from your journey.